Get your glow sticks out because Down Town Petey Brown is bringing the rave to Kings of the North on this weeks episode! DTPB is also a dirty, disgusting Packers fan and he and the Beefcake are insufferably happy after barely beating the worst team in the league. The Professor is the voice of reason, as always, offering perspective on a flukey Vikings loss. But just as the tempers get hot the gang cools off by drafting WWE Wrestlers to be on their favorite NFL teams. Is it a good time? WOO, WOO, WOO, YOU KNOW IT! Conspiracy Theories, The Challenger Space Shuttle, and gravy eating protocol are big topics of discussion on this weeks episode, as well as a little football. Join the gang as they get rowdy in The Bar, spout of cliches during 4 Down Territory, and The Beefcake turns the clock back to January, 1999 for Professors most painful trip down Memory Lane to date. As the Professor rejoices in yet another Vikings Victory, Da Polish Sausage returns to take a verbal beating on par with the beating his pitiful team received at the hands of Brett Hundley and the Limburger Packers. To cheer him up we spent a lot of time talking about ways to integrate the NFL and WWE wrestling and take a trip down Memory Lane to Vince McMahons attempt at combining the two, the Xtreme Football League (XFL) and it's short lived single season. It's better to burn out then fade away. It was a slow week in the NFC North with the Vikings and Bears on bye and the Packers continuing their spiral after a loss to the Lions. 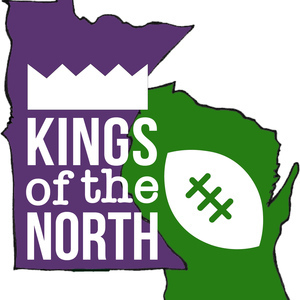 However, it was not a slow week on Kings of the North as the Professor gloats, Beefcake denies, Rhob instigates, and we all revel in the splendor that is John Gruden. After an extra long session in the bar the gang discusses their favorite sports commercials, makes their NFC North Predictions, and takes a little trip to Seattle for a stroll down Memory Lane. With the Vikings yawning their way to an easy victory in London and the Packers on their bye week the boys need an in studio guest to help bring the fun. With Hammsburglar locked away in the slammer for crimes against humanity we have turned to is estranged son, Chad from Oshkosh, one of the Wisconsin football systems roughest gems. You will most definitely want to check in for our most PG-13 Four Down Territory yet, Most Attractive Male Athletes. Parents, put your kids to bed before this segment because it is going to get steamy! Week 7: Fresh'n ya drink, Govna?! It's another purple-tinted celebration as the Vikings fly off to foggy London town for their first bye week of the year against the Cleveland Browns. The Professor is joined in his mockery of Beefcake by a newly initiated Vikings fan, The Fair-weather Fan, who brings a sense of humor that is more sizzling hot than the ginger mop on his head. The gang discusses the Sendejo suspension, NFC North QB play, and the greatest NFL touchdown celebrations of all time. You will not want to miss it! They say the first stage of grief is denial and in this episode you get to listen to The Beefcake languish in it stage as he tries to come to grips with a crushing defeat to the Vikings and a crushed collarbone on his star QB. The Professor takes every opportunity to gloat about his victory in the game as well as the Slap Bet, and the gang discusses a range of topics from more Brett Favre, great NFL nicknames, and Joe Flaccos impending fall from eliteness. Da Polish Sausage is back, and The Professor and The Beefcake lap up his tears to fuel their excitement for the impending border battle between the Vikings and Packers. Get hyped with us for this premier NFC North matchup as discuss such hot button topics as Davante Adams being a faker, the Bears unexpected new QB of the future, Brett Favres most iconic moment at Lambeau Field, and a very zany Four Down Territory featuring our own made up Touchdown Celebrations. This is an episode you will NOT want to miss! The Beefcake escaped from his kennel last night, but instead of looking for him Rhob made a few phone calls and we brought in two guests who are even louder, smellier, and more belligerent than The Beefcake, so give a warm Kings of the North welcome to Da Polish Sausage and Hammsburglar! These are two of the crassest, rudest, and most deplorable human beings we've ever met so prepare yourself for our most NSFW episode yet as we discuss the Davante Adams "cheap shot", the new Bears quarterbacks twitter game, and all things Vikings injuries, from busted knees to popped eyeballs. It only goes down hill after that. Try to enjoy. The good times are flowing, and so is the Hamms, as The Professor and Beefcake revel in their teams bouncing back into big early season wins as well as taking delight in Detroit being the most Detroity team that ever Detroited. Things get tense as the clock counts down on our most crunch time 4 Down Territory Yet, and the gloves come off completely as Beefcakes stroll down Memory Lane almost turns into a blood bath! All this and more on Kings of the North! Beefcake and The Professor try to find solace in their teams loss by taking joy in each others pain, talk smack at the bar, and get pumped up over the most exciting Four Down Territory yet, Best Stadium Songs! Beefcake and Professor Pigskin are giddy to celebrate their Week 1 victories, while Rhob leads the gang in a spirited Four Down Territory of the Greatest Sports Movies of all time. A mysterious caller phones in as the episode ends to disparage The Packers. Beefcake and Professor Pigskin catch you up on the offseason, look ahead to week 1 matchups around the NFC North, debate the best parts of being a NFL fan, and talk about what they're eating during the game.